Last week the Decoupling Working Group of the International Resource Panel (IRP) has presented its second report on “Decoupling technologies, opportunities and policy options (2014)”. The IRP is a body within UNEP (the United Nations Environment Programme) and the Working Group seeks to contribute to a better understanding of how and to what extent economic growth and human well-being can be decoupled from resource consumption and environmental impacts. In its first Decoupling report published in 2011, the Panel already showed that breaking the link between human well-being and resource consumption is necessary and possible but hardly happening. 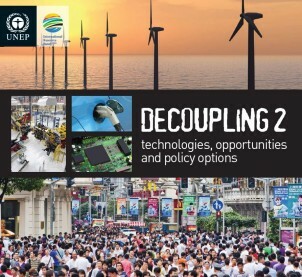 In this follow-up report – “Decoupling 2” – the Panel highlights existing technological possibilities and opportunities to accelerate decoupling and to reap the environmental and economic benefits of increased resource productivity. • Since 2000, metal prices have risen by 176 per cent, rubber by 350 per cent, and energy by an average of 260 per cent. 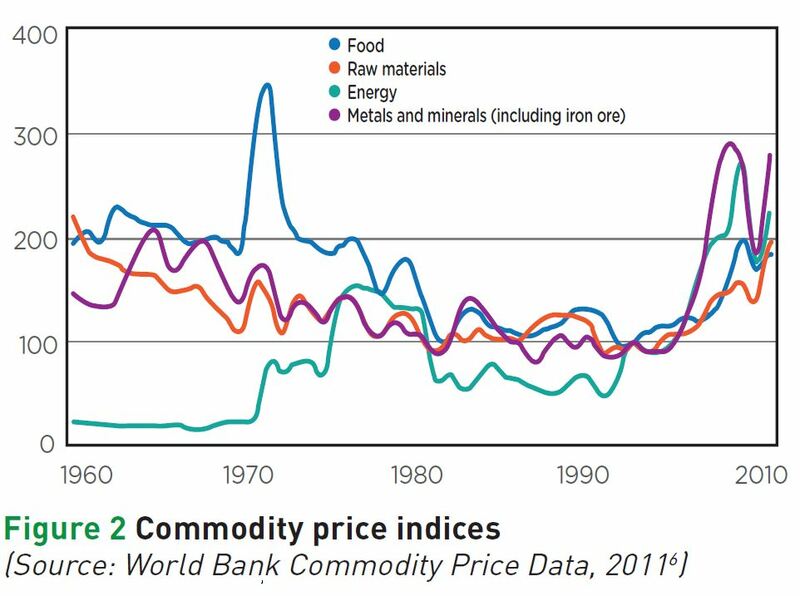 • Volatile food prices increased by 22.4 per cent from 2000 to 2012 compared to 7.7 per cent from 1990 to 1999. Some predictions point to a potential rise of global food prices of 120-180 per cent by 2030. Global markets cannot respond adequately by simply raising the supply of resources to meet demand. Decoupling must be pursued to ensure equitable social progress. But how? Overall, the working group estimates that decoupling technologies give an opportunity for resource savings of US$2.9 to $3.7 trillion each year until 2030. So, since decoupling technologies and policies are available and viable – what is holding back their realization? The report analyses that many economies suffer from blocks that “lock-in” existing patterns of resource use due to the legacy of past policy decisions and technological, behavioral, organizational and institutional biases against innovation in resource productivity. To overcome these obstacles the report calls on policymakers to create conditions that enable investments in resource productivity to become widespread. A strong leadership will be needed in the public and private sectors to overcome the resistance that is commonly faced by such deep policy changes and to promote the needed policy action. Finally the report explores some concrete economic instruments to push technologies and markets towards higher resource productivity. The working group recommends the use of taxation or subsidy reduction to gradually move the price of a chosen resource upwards in line with documented increases of energy or resource productivity. This way a “corridor” will be created within which prices could fluctuate a little; interventions would only be made when such fluctuations would leave the corridor, creating predictability for investors as well as for manufacturers and consumers. At the launch of the Decoupling 2 report during Green Week in Brussels, Professor Ernst von Weizsäcker stressed that market intervention will be needed: “you have to make energy and resource prices rise slowly and combine it with life line tariffs for the poor”. Achim Steiner, UN Under-Secretary General and UNEP Executive Director: “It is my sincere hope that the findings of this important report will inspire Member States to embed sustainable resource management and the concept of decoupling in the post-2015 development agenda.” With scientists and directors working for UNEP breaking down the neoliberal free market myth, will policymakers follow their advice? For more information have a look at either their detailed full report, the summary for policy makers or a 2-page fact sheet which can all be found here.